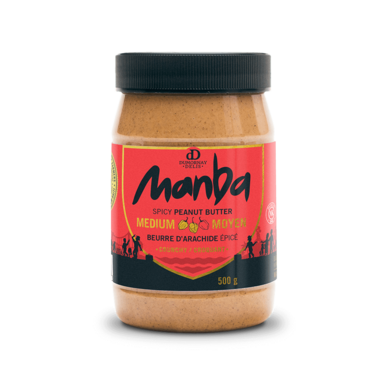 Manba is the only spicy Haitian-style peanut butter in Canada, and the only natural peanut butter to include premium peanuts imported from Haiti. On top of the social mission to support Haitian peanut farmers, the recipe and blend of ingredients makes Manba the most exotic, savory, and delicious natural peanut butter you’ll ever taste! Crunchy and moderately spicy, Manba Crunchy Medium is ideal on toast, slices of fruit, or a spoon! 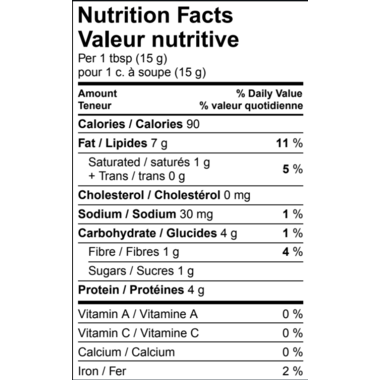 Ingredients: Dry-roasted peanuts from the USA & Haiti, organic cane sugar, sea salt and hot pepper. Very delicious peanut butter. It has a bit of a kick to it. Creamy taste easy to spread.